Springtime is the land awakening. Today I am thrilled to join the Spring Tour of Homes! If you’re landing here from the talented Maggie at Maggie Overby Studios, welcome!! I’m so glad you’re here. In the Northeast you just never know what you’re going to get for weather this time of year. We’ve had a pretty mild winter – last week we even had two beautiful 70 degree February days and it seemed that spring was just within our reach, and the next thing you know the winter storm Riley slammed the whole East Coast. We lost power and a few trees but were lucky compared to others. Mark spent the whole weekend with a chain saw in his hands, cutting down branches and half fallen trees, and removing one of our favorite evergreens that fell right over out of the earth onto our neighbor’s driveway. 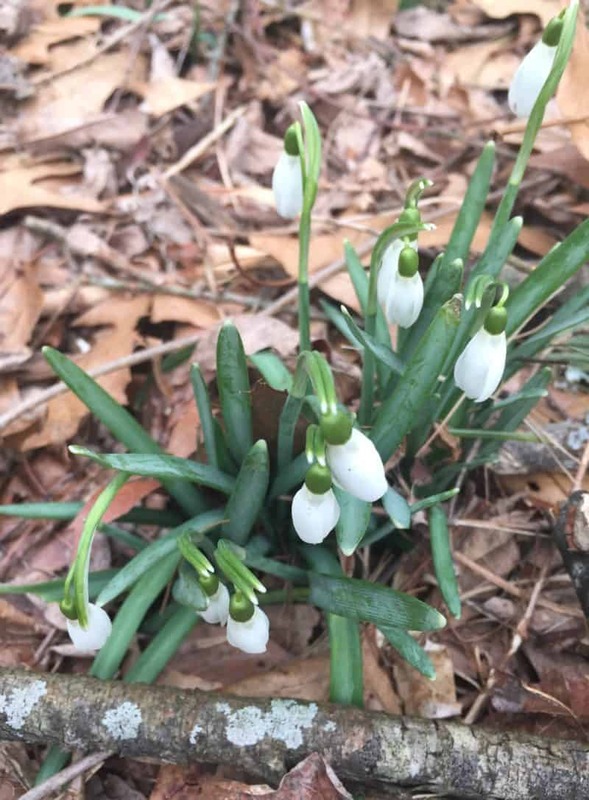 Yesterday, with snow flurries starting to fall around us, I noticed these sweet flowers popping up at the edge of our yard. Galanthus, commonly referred to as snowdrops, typically flower in the winter. With the rest of our plants, shrubs and trees still a good six weeks away from starting to bloom here in Massachusetts, these sweet flowers are such a welcome harbinger of spring!! The snow is still falling, but a few little touches inside go such a long way to cheer our house up. My absolute favorite way to bring a little spring to these lingering days of winter are with fresh greens and plants! Home Depot has orchids on sale for $12.98 at the moment – I was impressed by how healthy and full the plants on the sale rack were. Look how many buds are on this one above! My chunky blue patterned blanket was a Homegoods find. 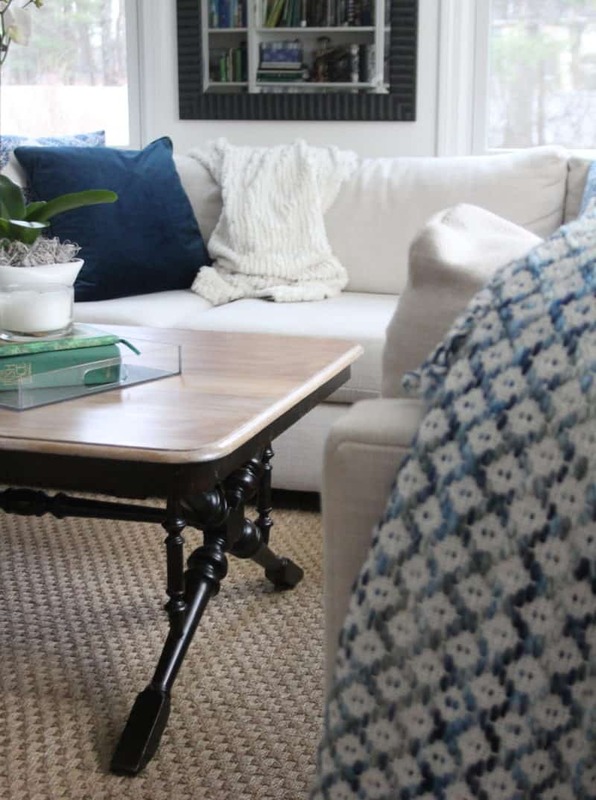 Check out the coffee table makeover here. 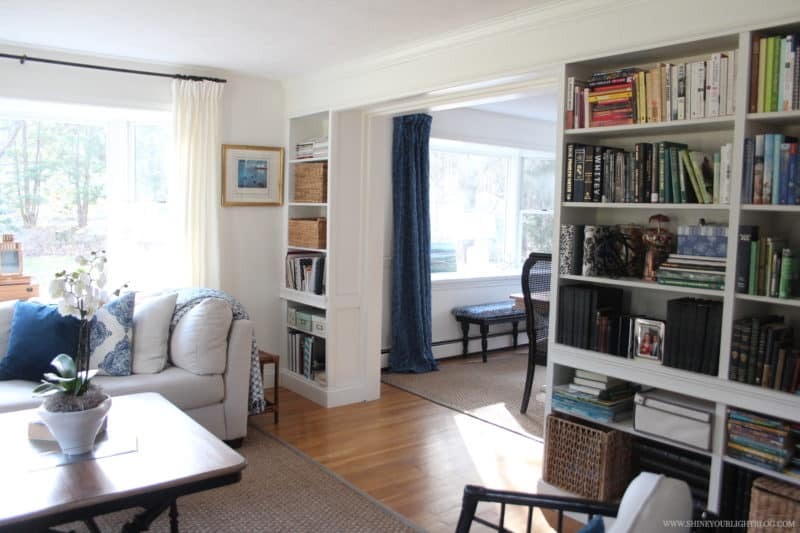 Books are a great way to incorporate a pop of color around the house too! 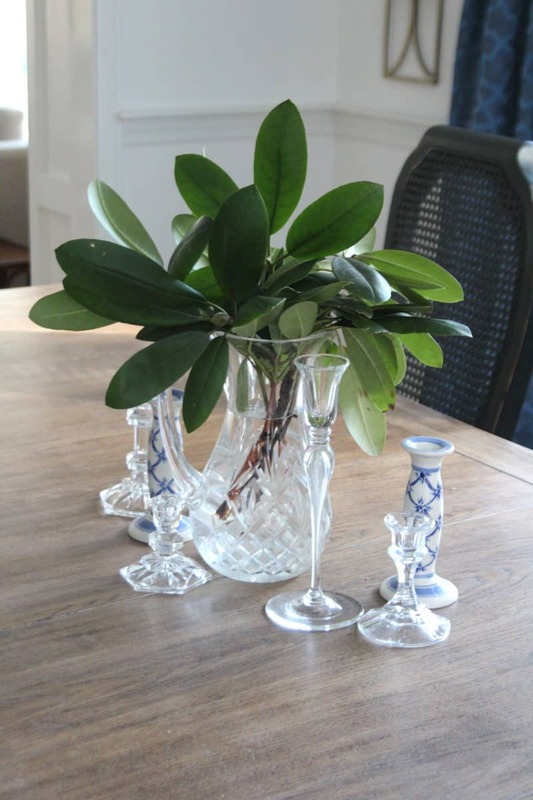 The DIY mirrored tray is great for coralling everything on the coffee table. Our living room opens up to the dining room where we eat all our meals. 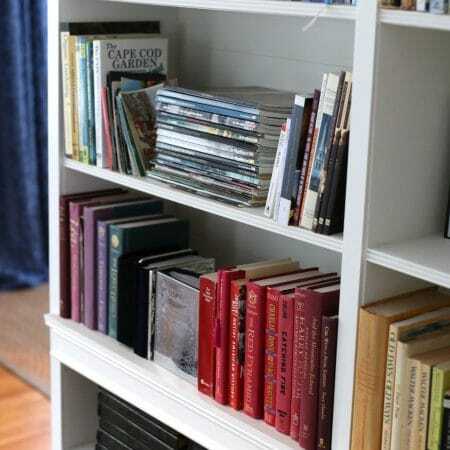 Read about the DIY bookcases here. The tulips at the grocery store were looking a little forlorn (I like to buy them when the flowers are closed so they last a while), so my overgrown rhododendron in the yard was happy to oblige with a little green for our table. It’s amazing how just a little bit of bright color can cheer up a space! Baked potato soup is one of my kids’ favorites and it’s so hearty, sometimes we’ll just have that and a salad for dinner. I’ll share my favorite recipe with you later this week! For last minute company I’ll often throw down one of my colorful scarves instead of a tablecloth. Strewn across the table, un-ironed, unfussy, a come-as-you-are vibe and a happy bit of spring color! When we’re not eating the dining room magically turns into an office for both Mark and I, he on one end with his laptop and me on the other. I’m so glad I gave this Craigslist table a second makeover! We really love the limed version. It’s such a nice bright room most of the time with two walls of windows and I actually really enjoy working in here until a) Mark gets on a work call (he’s not what you would call quiet :)) or b) the kids get home from school, and then all bets are off for getting anything productive done in here! Last year I bought a few potted herbs from Trader Joe’s and used them on our table throughout early spring, it was so cheery and fresh, PLUS when the weather warmed up I was able to transplant them to my deck containers. You can see more of my herb centerpiece in this post! If you are eagerly anticipating spring too, you’re going to love the rest of this tour! Head on over and visit Sara at Twelve on Main next for some beautiful ideas! Rugged & Refined Teen Boy’s Room – A Little Progress! Thank you so much Jolie! Beautiful spring tour!! Have a great week. Thank you for stopping by Jessica! I’m so sorry about the trees!!! But thankful that you are safe. Your home is always stunning and I love your colorful table! 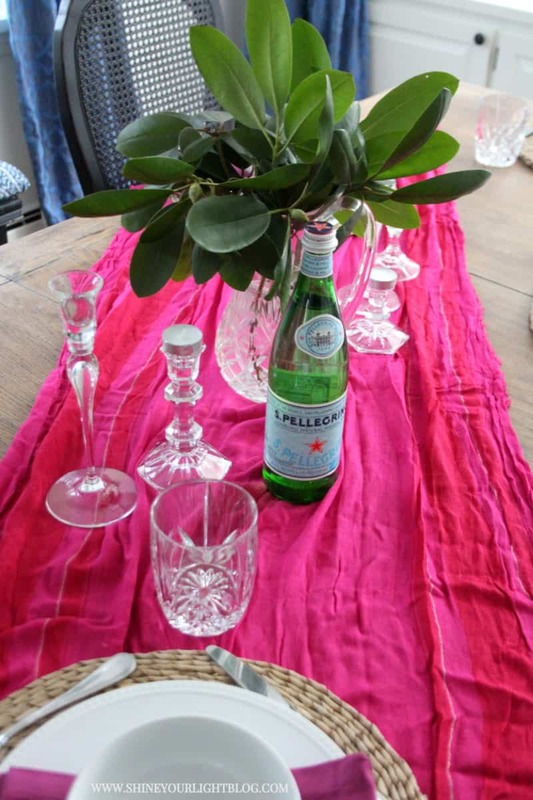 I think scarves make the best table runners. You are always so kind! Thank you my friend. 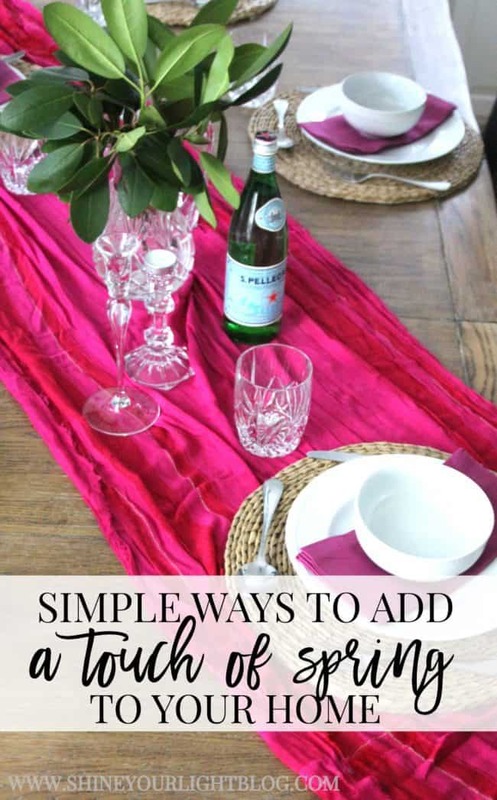 I love scarves for the table too and always look through in stores with that in mind! Just beautiful lisa! Now I need to find a pretty orchid. I haven’t had success keeping them going for very long but boy are they pretty when they are in bloom! Your table scape brightened this gloomy New England Day! Beautiful! Aww thanks Stacy! So glad to see the sun come out this afternoon!!!! Hope you fared through the storm okay. I was wondering if you got hit with that storm, too! We got over 3 feet and it looks like we may get another food Tues/Weds…..where on earth will we put it? We had trees down and power out for 30 hours, all the local businesses were closed…..except the pizza place, they were smart and had a generator and I think it paid for itself this weekend! 3′ of snow! And no power for 30 hours…..ouch. You got hit hard! Ours was all rain and flooding, I feel terrible for so many people along the MA coast that lost their home right into the sea. Hopefully this week’s storm won’t be as bad as predicted! Nothing like a winter thaw to give you a good excuse for a get together. 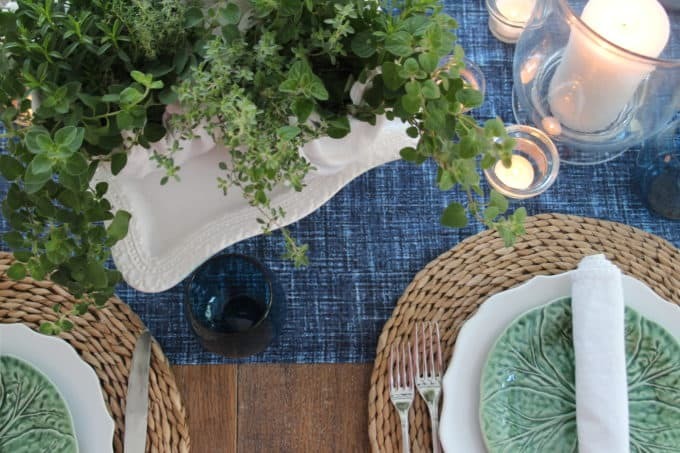 Great tablescapes are another good excuse! I am so looking forward to entertaining in the warmer weather Maggie! That’s my favorite – dining al fresco! Lisa, those two 70 degree days we had have me itching for spring to get here. Glad to hear you weren’t affected too much by last week’s storm. We are in Western Mass, and it wasn’t too bad here, but I heard there’s another possible storm this week! 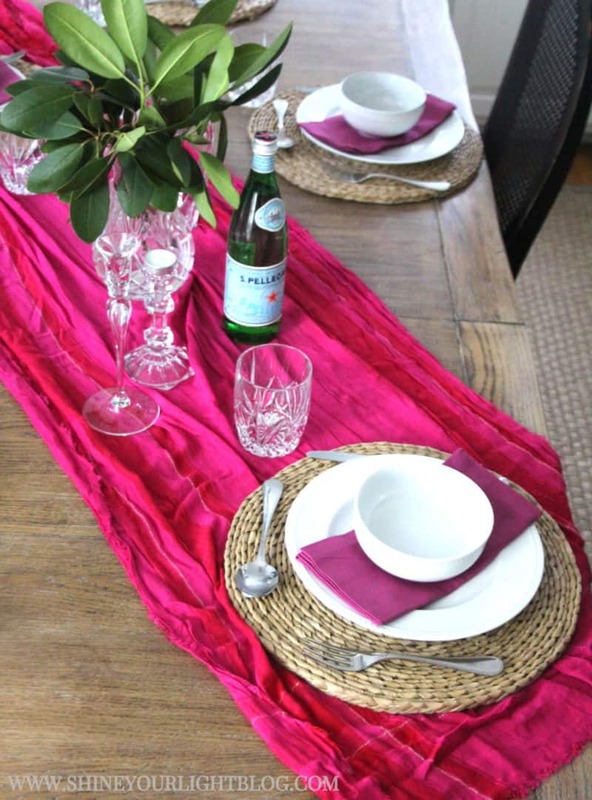 Your home looks gorgeous, and I love the idea of throwing a colorful scarf on the dining room table. Such a great idea! I can’t wait for more warm weather too Robin! Eventually spring will get here! Thank you for the kind words and visit….I appreciate it so much! Gorgeous spring tour, Lisa! I live in Maryland, and we had a similar incident with a tree falling, only it was our neighbor’s tree and it was blocking our road. My hubs spent a whole afternoon with the neighbors cutting it down, which makes me even more ready for spring. I love all the pops of color in your home. I can’t believe you got an orchid that cheap – I’m going to have to go see if our Home Depot is having a sale too. I have never owned one though and I hear they are a labor of love in terms of taking care of them. They are so pretty though so I think it’s completely worth it. What has been your experience? Marly thank you so much for your kind words! 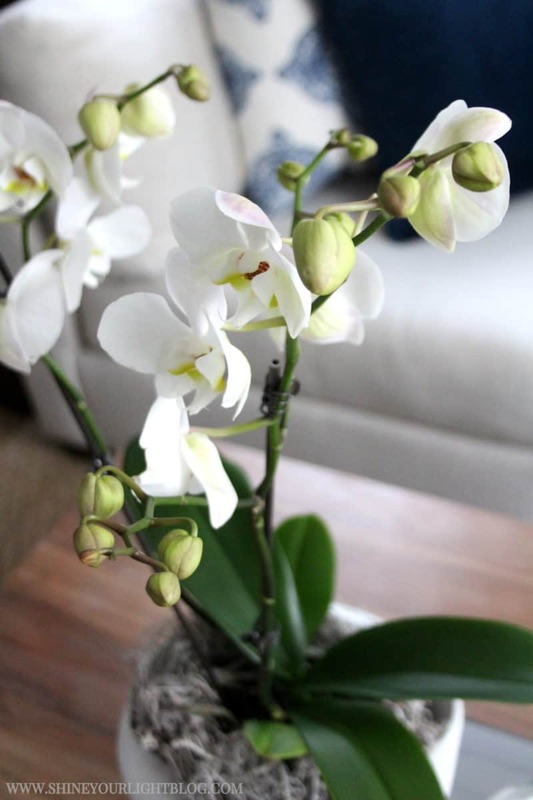 Orchids ARE super finicky, I have tried every method and trick in the book but can’t seem to get them to last for more than 6 months or a year. But oh are they so delicate and pretty! i love all of your fresh green touches, lisa! your home is cozy and refined at the same time and i love it! Nice tablescape. It is a great idea to use scarves! Thanks Mila! I love looking through scarves when they’re on sale specifically for my table! Lisa, this is stunning! 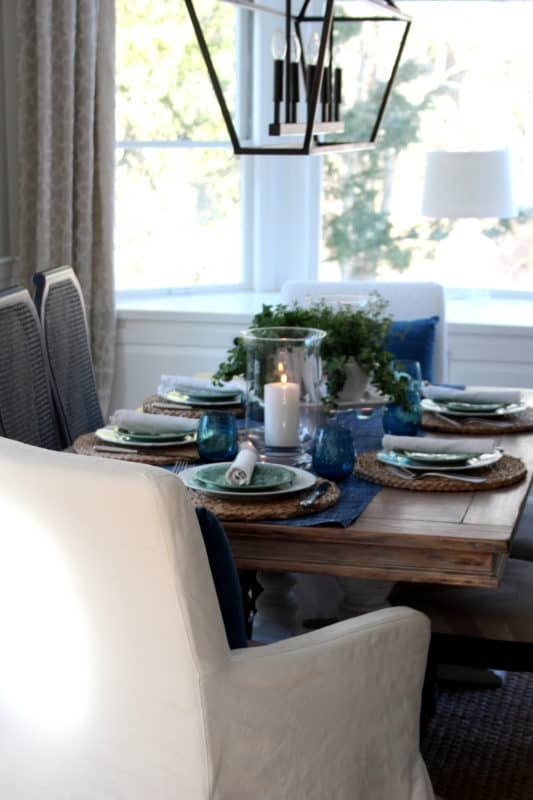 I love the calming neutrals on your sofa, and your dining table decor is gorgeous. I love that you also use it as on office. So many of us have multi-use spaces, and it’s nice to get ideas for how to decorate them. Thrilled you were able to join the tour- I simply love your home and style. Monica you are the best for hosting this whole tour!! Thank you so much, it’s been such fun to meet so many new-to-me bloggers and see all these different spaces! Looks great for spring. I love the little touches of green that pop in every room. Happy Spring! Thanks Ariel…..my rhododendrons give me great greens all through the year, and they last so long cut in water. Thanks for stopping by! Love all the ways you added Spring to your home! Beautiful tour! Thank you so much Laura! I’m fighting the grey days of late winter as best I can! Lisa, you have such a beautiful home! I completely agree with you that nothing in our homes should be too precious…it’s our family that matters most! I love how you’ve incorporated greenery and flowers as well as the pop of color on you dining table with the “unironed” (love that!) scarf 🙂 Thanks for giving us this glimpse into your home and Happy Spring…hope all that snow melts soon! Cindy thank you for your kind message! That unironed scarf pretty much sums up my whole life – a lovely mess! 🙂 So fun to do this tour with you! Beautiful spring styling, Lisa! 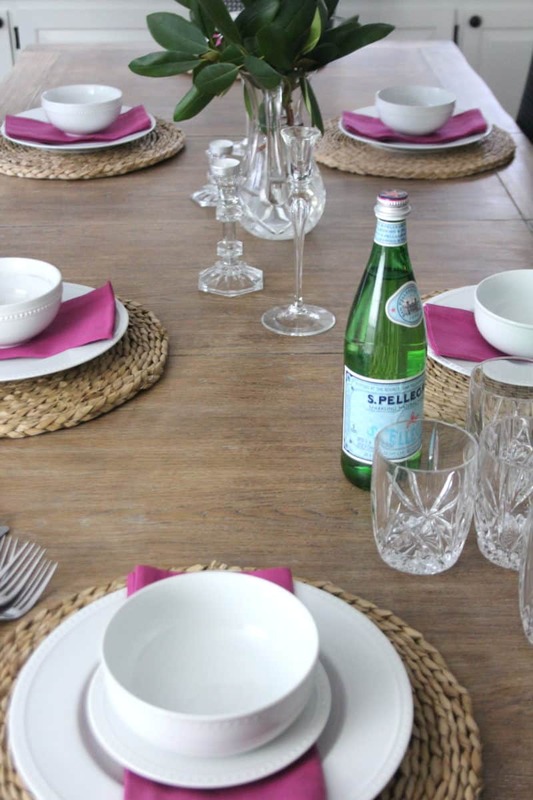 Your tablescapes are so inviting! I can imagine everyone enjoys them! Thank you Iris! This bit of color has definitely cheered up our house! So very pretty. Love the pop of pink! Thank you Mary! I don’t use much pink in decorating and it’s such a happy color, I’m really enjoying it on these grey days! I love how that pink color pops! Gorgeous! With the crazy weather we’ve been having in the Northeast the last week or so, I needed something to brighten up our house! Thank you stopping by, Ellen! Beautiful tour, Lisa! I love your use of greenery and textures throughout your home! 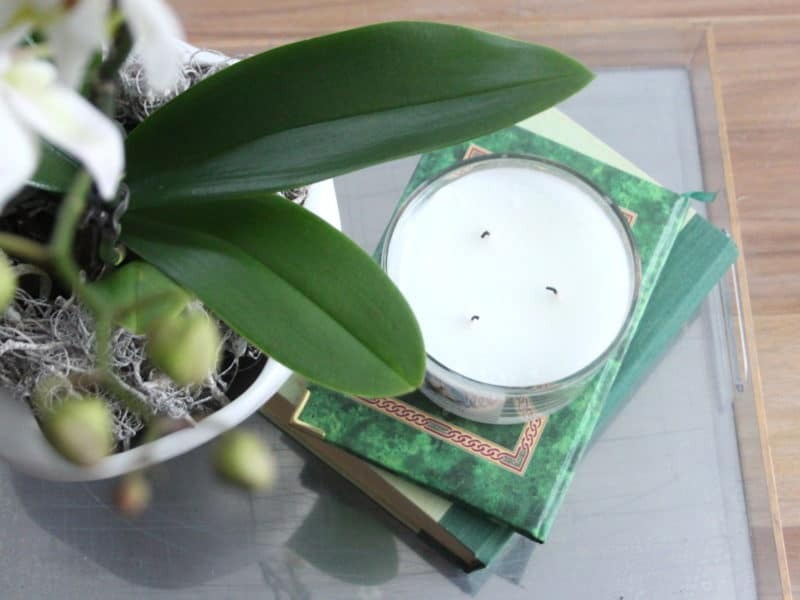 The touches of green with the books and accessories really scream spring to me! Your home look so welcoming and cozy! Thank you so much Saher! I love using whatever greens I can find in my yard all through the seasons! 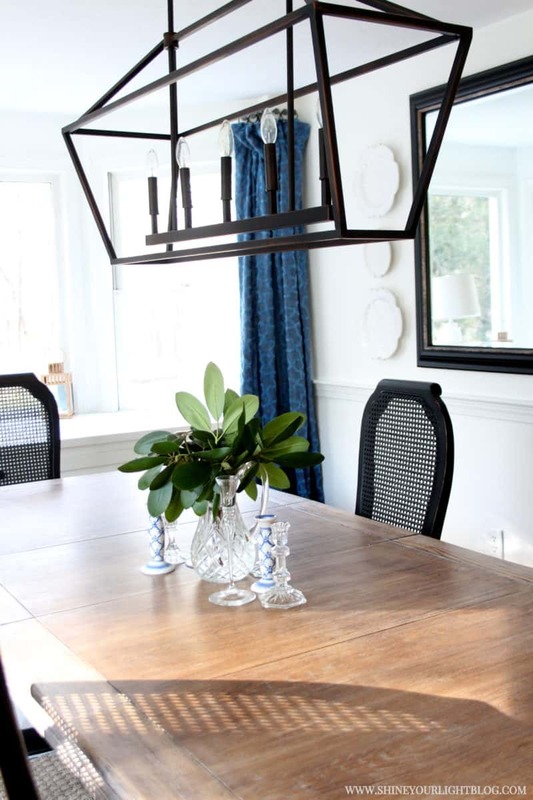 I love the idea of throwing a scarf over the table when guests come over. What an easy way to dress It up!! Thanks for your sharing your Spring home with us! Thanks Kathy! A scarf is a great way to add a little color!